Note: This whiskey was purchased by us for the review. At no point were we given a sample or bottle by Basil Hayden’s in order to create this review (although we wouldn’t have said no). No matter what, our opinions are always our own, honest, and hopefully helpful to you. A lot of people have been talking about this one, good and bad, so I figured I had to try it out for myself before I formed an opinion. This one will probably be a little light on the other information, as I know many people are already familiar with Basil Hayden’s already. If you aren’t, Basil Hayden’s is typically a good gateway bourbon for many people interested in dabbling into the firewater. At 80 proof but with a high-rye mashbill, Basil Hayden’s is a great blend of spicy, but not too spicy, while still remaining a smooth, easy drinker. In fact, it’s what I usually give my friends first when they’re wanting to try bourbon and then I ease them into higher-proof and more complex offerings. Don’t get me wrong, I’m not knocking it. It’s very good at what it is and is a solid pour, but for the more advanced drinker, it’s not very complex and leaves you wanting more. 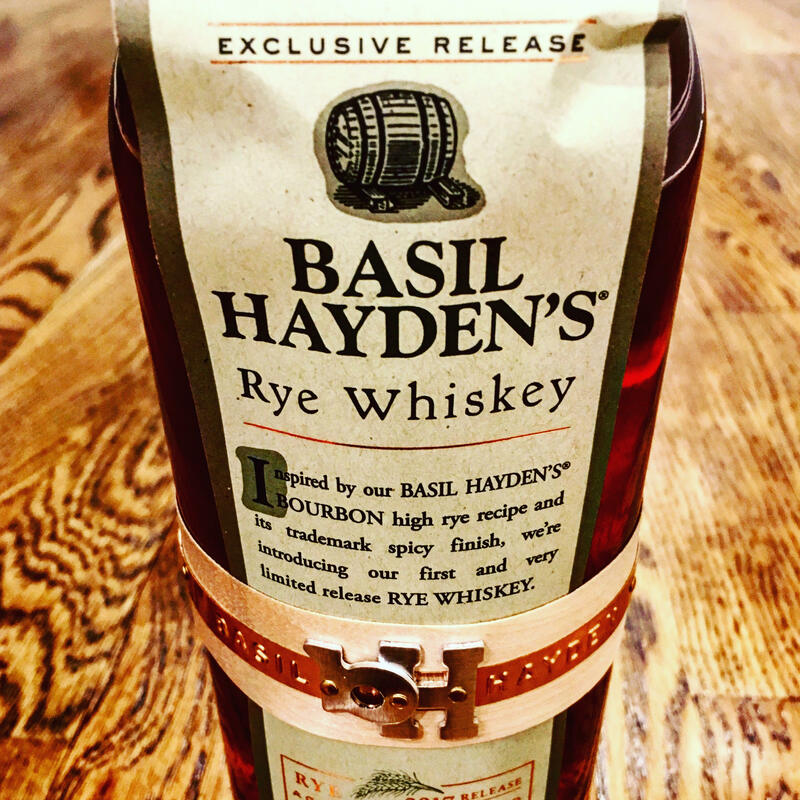 A Kentucky straight rye whiskey, Basil Hayden’s Rye Whiskey achieves its deepened and distinctive taste with the addition of a unique, re-barreled rye. The re-barreled rye begins as a four-year-old traditional rye whiskey, which is then dumped out and further aged an additional seven years in newly charred quarter cask oak barrels. Just a touch of this re-barreled rye expertly blended with traditional Kentucky straight rye whiskey amplifies the warm aroma of baking spices and adds differentiating depth to Basil Hayden’s Rye Whiskey. Bottled at an easy-sipping 80 proof, the result is a versatile rye whiskey that is both approachable and flavorful with notes of char and oak. So, essentially, what you can deduce it’s a well-aged, proofed down, smooth rye that is versatile (good neat or in cocktails). The other interesting fact is that it’s the first limited release from Basil Hayden’s, a trend we’re seeing more and more in the bourbon community. One little side note rant. I know the packaging of Basil Hayden’s always looks good on the shelf, but to me I kind of think of the packaging of Basil Hayden’s like I would snow. Snow always looks good for the first couple of hours it falls. You take a minute, stop and look at it and think to yourself that the landscape looks very pretty covered in white fluffy stuff. Then, inevitably, sand gets put down on the road, the snow melts a little, and all you get is brown snow getting the bottom of your jeans all wet. That’s kind of how the labels of Basil Hayden’s work for me. They look good on the shelf, but somehow, they always get ripped and don’t look as good once I get them home. Nose: This one smells floral with a hint of spice. It’s very light on the nose. Taste: I do get a light hit of spice in the mouth, but it doesn’t get past the very front of my mouth and never makes it to my throat. It’s a very light and refreshing whiskey. I do also get hints of oak and caramel, but nothing is really complex here. Finish: Very short and dry. The spice is very short lived and you’re only left with a small caramel aftertaste. This one is not one of those whiskeys that coats your mouth with a film, it just passes through your mouth. This is a very refreshing taste though. It’s almost like the white wine of whiskeys that is good for a summer’s day. Overall Verdict: I mean, I’d Take It if you gave it to me, but for the money, I’d much rather get other things in the $50-$60 dollar price range. I think it’s extremely difficult to market a whiskey that’s great for cocktails in that price range as there are many great bourbons/whiskeys in the $30 and under category that can give you the same experience. I like that they’re trying new things, but this one is a pass for me.